At the Oakland Museum of California, our identity and mission of connecting communities to the cultural and environmental heritage of California, extends far beyond the Museum walls. At the heart of our mission is OMCA’s long-standing commitment to engagement and partnerships within the community. Also known as the “Museum of the people,” OMCA’s legacy of engaging in deep relationships with individuals, organizations and diverse communities has helped to shape space for a range of community voices, in a variety of programs and exhibitions. OMCA is continuing to engage Oakland in participatory arts projects outside the museum’s walls, through OMCA Connect. OMCA Connect brings together community members, professional artists, community-based organizations, and Museum staff to create participatory arts projects in community spaces and surrounding neighborhoods. The Oakland Rover, OMCA’s “mobile museum,” is one of the many tools used. OMCA Connect is supported by a grant from the James Irvine Foundation. 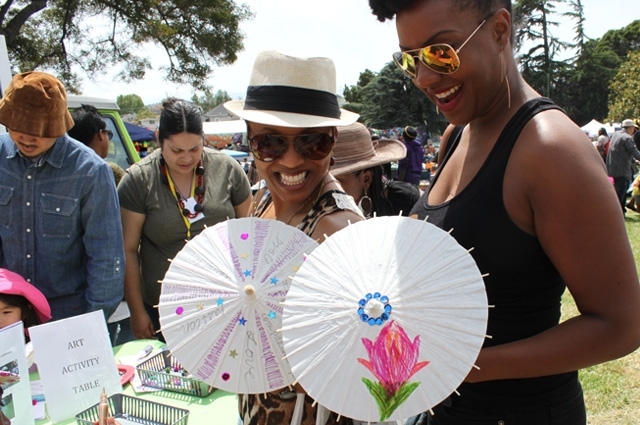 Visit the Oakland Rover and OMCA's art making table at events around the Bay Area; attendees shown here at the 2014 Malcolm X Jazz Festival. OMCA Connect is supported by a grant from the James Irvine Foundation. Additional support is generously provided by Pacific Gas and Electric Company. The Oakland Museum of California presented a new public art installation on the Museum’s exterior wall adjacent to 12th Street and Lake Merritt in the fall of 2014. Created by artist Brett Cook in collaboration with community partners, Reflections of Healing came out of a process that combined wellness, community engagement, and art-making. The artwork consists of portraits featuring Oakland residents who, through practice or legacy, demonstrate healing. The Reflections of Healing Celebration and Mural Unveiling was held on October 24, 2014, from 4 pm to 8 pm and will include art activities, performances, and food in addition to participatory activities facilitated by healers depicted in current and former Reflections of Healing portraits. Reflections of Healing was developed in partnership with the Life is Living Festival. In the summer and fall of 2013, the Oakland Rover took participatory art activities to public spaces in Oakland's San Antonio, Chinatown, Uptown and West Oakland neighborhoods. The resulting artwork and portraits is featured in a mural at OMCA along Oak Street and 12th Streets. The 'We Dream in Art' mural was unveiled on Friday, February 28! Watch our video about the project. The Oakland Rover is OMCA’s interactive electric mobile museum whose mission is to bring participatory arts to the community. The art activities foster creativity, art making, and visioning processes that will enrich participants both within and outside of the Museum walls. With a custom-designed truck bed with cartridges that pull out to facilitate creative community projects, the Oakland Rover brings OMCA to you! The Oakland Rover debuted in 2012 as part of OMCA’s we/customize exhibition, hitting the streets with trips to Bay Area maker-centric sites like farmers markets, Art Murmur, Mini Maker Faire, and the Alternative Press Expo among others. Since the summer of 2013, the Oakland Rover has connected with residents of San Antonio, Chinatown, Uptown and West Oakland communities. ● It’s one of a kind! The Oakland Rover was designed by Martin Sprouse and Dan Rosenfeld, in collaboration with OMCA curators. ● It’s electric! The Oakland Rover’s pre-customized self was built by Canadian Electric Vehicles, is a Might-E-Truck at its core and plugs into a 120 AC outlet. The approximate energy use to fully charge the batteries is 16 kwh. ● The Oakland Rover can fit into the OMCA Galleries. In fact, it’s the first truck to cruise all around the OMCA grounds! The Oakland Rover is made possible by Pacific Gas & Electric Company. In fall of 2013, the Oakland Museum of California embarked on the Neighborhood Identity Project, which aims to understand the needs and values of specific Oakland neighborhoods with the goal of strengthening ties between these communities and the Museum. The Oakland communities included in this project are: Oakland Chinatown, West Oakland, Downtown and Uptown, and the San Antonio and Fruitvale neighborhoods. These areas are in close proximity to the Museum, and participants were asked to share the unique strengths and challenges that shape their neighborhood. OMCA Connect brings together community members, professional artists, community-based organizations, and Museum staff to create participatory arts projects in community spaces and surrounding neighborhoods. Below, see some of the many stories about our work and ways that OMCA Connect has built community in Oakland.